National landmark hotel centrally located 1/2 block from Atlantic Ocean and walking mall. Third generation family business serving breakfast on our European style front porch, skylit dining room and secluded Garden terrace. 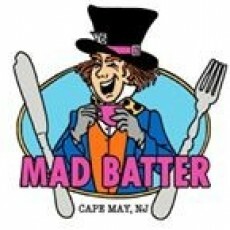 The Mad Batter is the Granddaddy of Cape May restaurants as the non traditional tradition with live music, daily happy hour and a beautiful 21 room hotel on site.